It is not possible to talk about tomatoes, the Mediterranean diet and Greek food without mentioning Gemista (or Yemista). 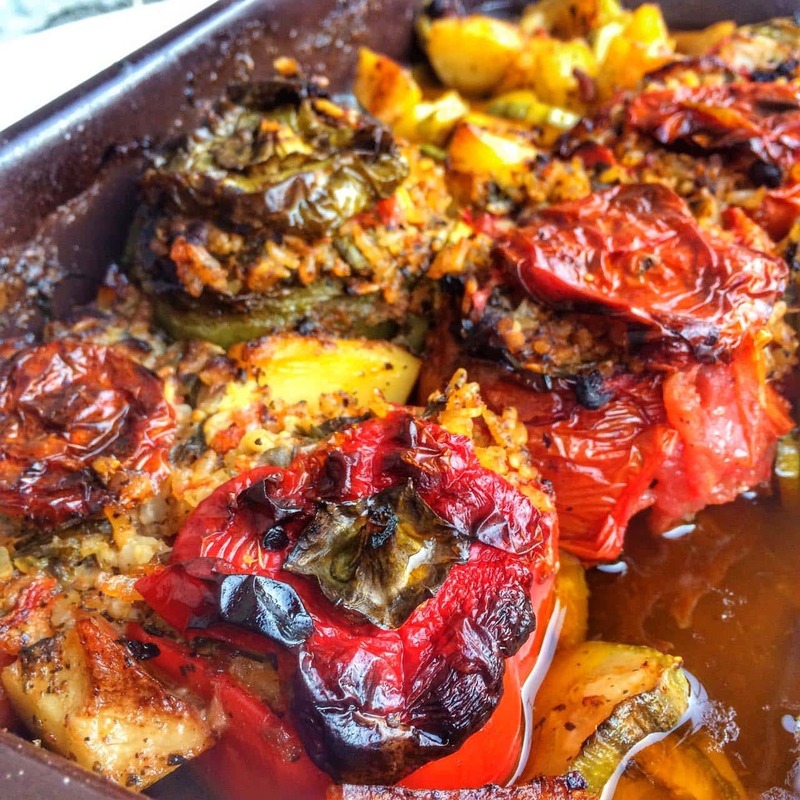 Gemista are vegetables usually tomatoes, bell peppers, zucchini and eggplant filled with rice (sometimes with ground meat) and baked in the oven. Gemista translates as “ones that are filled”. And as I mentioned earlier my mom’s gemista happen to be my favorite food. Now I need to mention that yes, this recipe has a lot of olive oil for non-mediterranean standards, but don’t let that scare you. As with most people’s favorite foods, this is also a comfort food for me, but as opposed to many comfort foods this one is healthy. At first glance you may think it’s a starchy dish, but once you take a look at this recipe you will notice that there are plenty of vegetables, to be exact, for each gemisto you eat you get almost 2 servings of vegetables. Why? Well the rice itself is mixed with some more vegetables; in fact you only eat about a ¼ cup of rice per serving. Now I need to mention that yes, this recipe has a lot of olive oil for non-mediterranean standards, but don’t let that scare you. First of all there is plenty of olive oil left in the pan so unless you drink it or mop it up with bread you won’t be getting all those calories. Secondly, as I have mentioned the beauty of the lathera-Greek vegetarian dishes with moderate starch and a good amount is olive oil is that you actually end up with a moderate amount of calories because the vegetables hardly add any calories to the meal. She only fills them with rice, not ground beef. It is a summer dish; beef would just make it heavier and add calories. She mixes the rice with a bunch of herbs, which makes them super tasty. There is olive oil in this dish and it is important that you use it, otherwise you won’t get this melt-in-your mouth sensation. Trust me. I recently saw a recipe for gemista on the site of a popular US NYC newspaper that used only 3 tablespoons of olive oil, that will not work, you’ll end up with a hard, tough and dry gemisto. She cooks potatoes with them. By adding potatoes you actually have a whole meal fit to serve guests. And did I mention that this recipe has no animal products, so perfect for vegans too! Ok this is my mom’s famous recipe, it will take you about an hour to do the prep, so you are better off making a big batch, these last 2-3 days and they taste better the next day. Preheat oven at 400 Fahrenheit (200 Celsius). Place the empty tomatoes and peppers along with their caps n a large pan about 3 inches deep. Take 2-3 zucchini peel them and grate them, put the grated zucchini in another bowl. In a food processor add an onion, 4-5 garlic cloves, a bit of oil about a teaspoon and some salt. Mix but not too much (you don’t want a paste). Add the onion mixture to the zucchini. Take a small green bell pepper and also dice it and add to the zucchini mixture. Finally take a small potato (a bit larger than an egg) and grate it and add to the zucchini mixture. Now strain the juice from the tomatoes (squeeze the tomato with your hands too) and save in a separate bowl. Now you should have 3 bowls one with tomato, one with zucchini-potato-onion mixture and one with tomato juice.Cut the tomato in small pieces and mix it with the zucchini mixture. Add 1 tablespoon salt, dry mint, parsley and tomato paste. Now add to the mixture 10 to 12 tablespoons short grain rice and 1 teaspoon lemon juice. Finally add ¾ cup olive oil. Let the mixture sit. Now start cutting the potatoes. Take 2 lbs. of potatoes, peel them and cut them into quarters, place in a bowl. Take 3-4 zucchini, peel and slice and add to potatoes. Add ¾ cup olive oil, 1 tablespoon oregano, some salt and 2 cloves garlic cut n small pieces. Mix well (with your hands preferably). Then add the tomato juice which you had saved from the tomatoes in step 8. Now start filling the tomatoes and peppers with rice all the way to the top and close with their caps. Add the potatoes to the pan, making sure to place around the tomatoes and peppers so they don’t slide in the tray. If there is any rice mixture left mix it with the quartered potatoes and add to to the pan. Add 5 cloves to the potatoes and about 5 allspice. Add about a cup of water, but not on top-you don’t want to “wash off” the oil. Add the water in a corner of the pan and tilt slightly so the water goes everywhere. Bake in the oven for about 15-20 minutes at 400 Fahrenheit (200 Celsius). Then reduce to 320-340 Fahrenheit (170-160 Celsius ) and bake for another 1-½ hours. If you notice it getting dry, add a bit more water. To see if it is done, check the rice it should be soft and mushy. 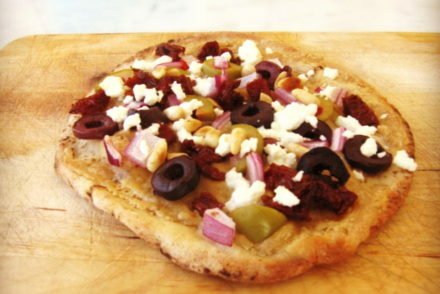 This dish is a lathero and it is enjoyed best at room temperature with feta. 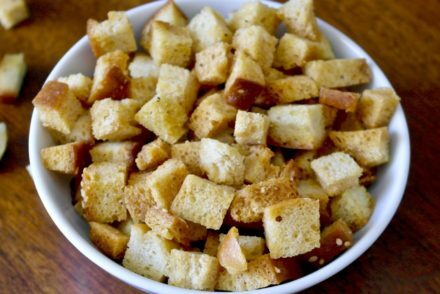 I don’t eat it with bread, as there is the rice and potatoes, but most Greeks do. thank you so much..both my parents and all my grandparents were of greek descent..(spelling)I so enjoy good greek food, but can’t seems to make anything taste right….i an’t wait to go shopping tomorrow to try the gemistas…my auunt would stuff the squash and squzh flowers, also…..i’ll let you know how they turn out.. This recipe looks great! I have some arborio rice at home, would that work? If you cook it right . allow cook time when it is in the oven. So you dont over cook it. One other question – when you say reduce the temperature to 170-160, is that degrees F or degrees C? Kirsty, It is in degrees Celsius, which is 320-340 degrees Fahrenheit. Thanks for pointing that out! i made these during Great Lent – they were fabulous, though labor intensive (more than an hour for me)! But it makes a lot, and I loved them! Thanks for a great recipe! Kali Anastasi! Great! Yes, these take a bit more work, but it is so worth it! I have just come back from Greece and am very keen to make these. I had many variations in Greece but my favourite had a lovely lemony taste to the rice. I just want to be clear that the rice is not pre cooked. Yes the rice is not precooked. I’ll add that on the recipe. They are delicious and do actually taste better a day or two later. So you put the rice in completely raw right? I was always under the impression you have to par cook the rice or even fully. This is a very interesting recipe I will be sure to try it. Thank you for posting. Hi Nicko, Yes, the rice is not cooked at all. Let me know how it works out for you! You didn’t mention what to do with reserved juice of the tomatoes, I’ll be putting it in the pan with a little less water. I’ll let you know how it turns out. The reserved juice is mixed in with the potatoes in step 10. I just added it, thanks for the question! For the rice, as I mention in the recipe just choose short grain rice, no need to look for special varieties. Thanks for this recipe! The Gemistas sound yummy and I will definately try it on a day that I have lots of time. The fact the steps are numbered is great! But I’m still wondering about a couple of things. In step 8, it’s the insides of the tomatoes (the meat) that you squeeze the juice from, right? Doesn’t adding the tomatoe juice to the potatoes make them soggy? And about the rice, would basmati work? I live in Sweden and don’t really know what a short-grain rice would be. And just to make sure I understand – the tomatoes are utlimately filled with zuccini+a chopped bell pepper+onions+chopped tomatoe meat (that was scooped out)+uncooked rice+herbs+a grated potato. It’s a complicated recipe and I want to be sure to get it right! Yes, that is correct. The potatoes will roast absorbing the liquids so they should come out soggy. Short grain is short, stubby rice. You could try Italian arborio. Basmati would not work as well, due to texture and flavor. Elena, zucchini can be large–what length in inches would work best? About 5-6 inches would be a typical size for zucchini here in Greece. Have made many variations but love this recipe. will try it. Question..You say to cut the tomatoes on the base? So basically turn them upside down and then cut and scoop? I have not heard of this before. Is there a particular reason for this technique? 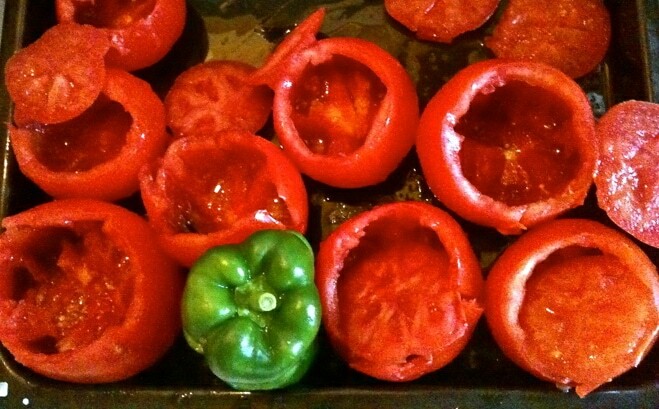 We have Greek friends who make a big tray of these every summer from the bounty of their garden. They are a favorite of mine, but never knew the recipe. Maria says, “a handful of this, a little of that, you come watch me!” I really should. My husband is Greek, but I’m not. After 34 years of marriage, I cook the lamb for Easter! I love Greek food, better than my Midwest, Scandinavian favorites! 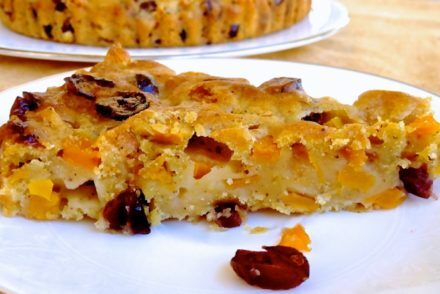 hi Elena, i love all the recipes you share and i thank you! my grandmother, my mother and I as well, have always added ground beef to our yemista (using Carolina long grain rice and sauteeing everything) but i am looking forward to trying it your way especially now that my son refuses to eat meat. we have never used oregano or mint and add scallions in addition to yellow onion. i hope to make your version of yemista this week and i’ll be sure to let you know how my family enjoyed them. Yes, please share your experience! Since discovering your website yesterday, I want to cook every single recipe that you have posted. This particular recipe sounds fabulous. I can’t wait until tomato season to try it. I make Italian rice stuffed tomatoes, which are very good, but these sound even better because more flavors are involved. I made your recipe for spanakorizo for lunch today and was pleased to see that my husband and two children could eat 2 pounds of spinach at one meal. We ate it in the Greek way, as you described, at room temperature with a small wedge of goat feta. It was super delicious. I do wish that your recipes were indexed by main ingredient so that it is easier to find recipes for each vegetable. I waited till now (summertime) to make this dish. This morning I brought home bags of the freshest tomatoes, zucchini, peppers, onions and potatoes from my local farmers market. After an hour of shredding and chopping, it went into the oven. While baking, we all got very hungry, because it smells incredible. We took a long walk until it cooled down and we came home to this incredibly delicious meal along with a slice of feta. We are looking forward to the leftovers for lunch tomorrow. I didn’t have a loaf of crusty bread, but I will have to buy some to sop of the incredibly delicious sauce that forms in the bottom of the dish. Or maybe I will use a few spoons of it to sauce a plate of pasta, and add a few crumbled bits of feta. Thank you for sharing this delicious recipe. Thank you for sharing Christine! Great idea for the leftover sauce! Cant wait to make these, with tomatoes in season now! 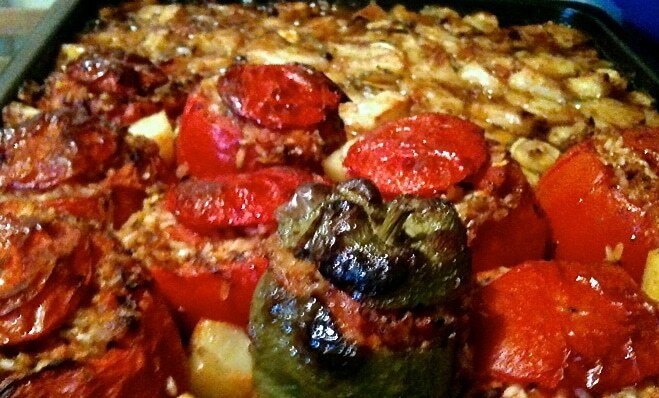 In the past, I have made Hungarian Stuffed Peppers, with yes…meat. And freeze them. I usually make a massive amount and then enjoy them all winter long. 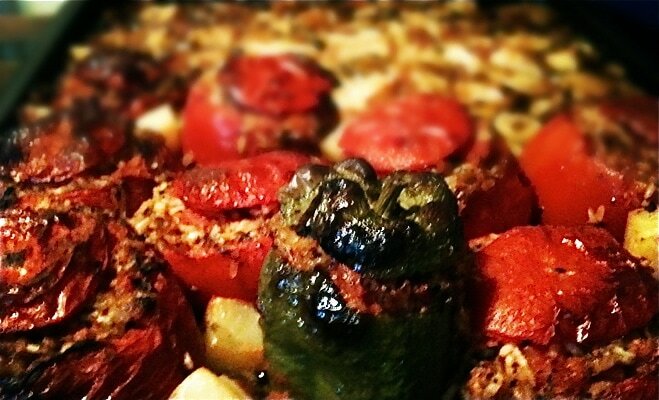 I imagine Greek Stuffed Peppers would freeze well too? How about tomatoes? Have you ever frozen your Gemista? Hi Nancy, I have not put gemista in the freezer, because we usually eat them over 2-3 days, so there is never any left 🙂 I imagine stuffed peppers would work but not sure how well stuffed tomatoes would be frozen. We made this dish last night, and despite the amount of preparation, found it delicious and worth making again! However, there was one part that did give us trouble probably due to the rice we used. We ended up using short grain brown rice, but found the rice still partially uncooked after the suggested 1 1/2 hours at the temperatures in the recipe. Would using regular white short grain rice be better? And if so, what would be a good short grain rice to buy if the brown rice did not cook at the suggested times and temperatures? Thank you again for the detailed recipe! Than you Eric! Brown rice takes a longer time to cook and I find that it will always have a bite no matter how long one cooks it. I would not use it for this particular recipe. So, I finally had time to make these. I good solid hour prep time, which I don’t mind, it’s actually very soothing to me. After prep, I popped them in the oven and couldn’t help turning on the light and looking every few mins. The house smelled amazing and I was starving by the time they came out. The rice still just had a small bite to it but all I could find was the short grain brown rice. Next time I’m going to let the mixture sit for a bit and then bake a little longer. The rice that was mixed in with the potatoes was nice and soft. Love this and will make again and again. I have made several of your recipes so far and everyone I have loved. Thank you for sharing and your wonderful website. Thank you for sharing Angela. Yes, I find that brown rice will still have a bite to it no matter how long you cook it. I made this this week with my large home-grown tomatoes and peppers. It was delicious and we had enough for 3 meals. I had extra rice mixture so stuffed a small butternut squash which I also added to the pan. Definitely slow food but worth the time and effort taken. I will look forward to making this again next summer. Love the butternut squash idea! Yes, we usually eat gemista over a few days. I’ve just made these, they are currently cooking in my oven! I’m just wondering if it’s okay that the potato and courgettes are piled up all round the Gemista? Should I stir them or leave them alone? It smells delicious though! Oh and you didn’t put tomato paste in the ingredients list or the lemon juice, thankfully I had some on hand. Oh and one final question, I’m using a fan assisted oven is 150/160 degrees still okay as the twenty minutes at 200 has burned them a bit. Hi Caroline. The potatoes and courgettes should be spread out, so they can cook well. Not sure regarding your comment for the ingredients list, both tomato paste and lemon juice are on the ingredient list. Yes temperature should be lowered after 15-20 minutes, a fan assisted oven may require different cooking times. Hi Elena, I’ve made this recipe for family several times now and it always comes out great. One added note to the mention of brown rice – I always use it, and in order to deal with the cooking difficulty I have found an easy solution. While preparing everything else, put the rice in a pot with water, heat only until the water is just hot to the touch, and then turn off the heat and let the rice sit until you’re ready to use it, at which point you can just strain the rice. The rice is still mostly uncooked so it can absorb all of the flavors while cooking perfectly in the tomatoes and peppers. I love your website and all of the great recipes and health facts! Thank you! Great! Thank you Christopher for sharing this brown rice tip! Absolutely delicious! I prepped the peppers on a Sunday for weekday dinners. Just added the potatoes the next day, popped the whole thing into the oven, et voilà! I agree that the copious quantities of olive oil are necessary for texture and taste. There was tons of oil left at the bottom of the baking pan. You really don’t end up eating all of it, so resist the temptation to skimp on the oil. For North American cooks: I used Calrose rice for this recipe, and it turned out beautifully.